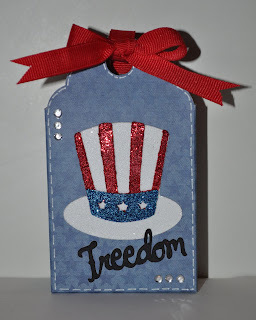 This week's challenge at Whimsical Wednesday is to use bling, brads and/or buttons in your 4th of July design. I chose to make a cute little treat bag with some glittler and some bling...simple and sweet! I love your cute little treat bag. That glitter really makes it POP! I really love the blu background paper. It is a beautiful shade of blue. What a great tag! I love the glitter hat and ribbon! Great job! Such a cute little tag. I just love the hat and the bling so pretty. The bow ties it all together so perfectly. Such a great job with the challenge. Oh I love the hat and all the shiny glitter accents against the "denim"like paper. Very patriotic. Now, if I could just get motivated to make some wonderful tags like yours, I would be happy! what a super tag! I LOVE the background paper! So pretty! The hat, lol ~ I almost used ~ turned out PERFECT too! Love all the bling! Great job! This tag is so sweet! I adore the stitching, that red ribbon pops & really coordinates so nicely with the hat. I am loving that glittered effect & the bling. Wonderful job! what a great tag- love all the bling. TFS with us at FCCB.